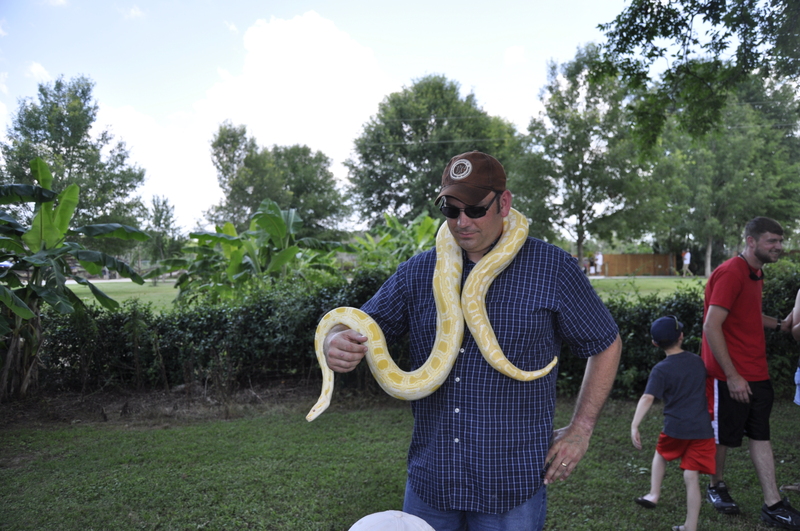 4 (more) Dangerous Temptations a Pastor Must Resist (part, 2): How to avoid becoming weird. Well, the last post I offered 4 dangerous temptations that pastors must resist. Here are 4 more. 1. A pastor must resist the temptation to be preoccupied with the ministry to the exclusion of fun and friends. I’ve heard it said that good pastors make poor friends. Once my wife observed, “It seems like pastors ‘get weird’ over time.” (She’s qualified to say this since she used to be a “PK” and now she is a “PW”). There is probably a lot of truth to that, but learning to have a little fun along the way will probably make me a better friend and help me avoid “getting weird.” Although the picture to the left might indicate that it is too late! I could easily spend every waking moment working in the ministry. There is always something profitable to be done. But exercise and fun are necessary in their proper place. A man in my church has reminded me of this repeatedly. He’s taken the time to teach me how to play tennis (he is a very patient teacher), get our two families together for various activities, etc. Two helpful hints here: 1) Pastor Dan Trayer, who was my pastor growing up, gave me this advice: “Guard your day… Sunday is the King’s day (Jesus) and Monday is the queen’s day (your wife).” Guard a day off as much as possible for family, friends and fun!. 2) I’m also learning to find a few other “pockets” of time in my schedule throughout the week. I might be the oldest guy out there playing a pick-up game of basketball, but if the young guys will have me, I’d like to try to avoid “getting weird”– if that is possible. 2. A pastor must resist the temptation to think that his ministry is the only viable one in the area. Of course we think that our ministry most closely models the New Testament model, right? Well, if we know anything about the churches in the 1st century, we know that they faced most of the problems we face in the 21st century. A cursory glance at Revelation 2-3 will demonstrate this. But we do tend to think we’re right on our ministry philosophy — after all, if we had the wrong approach to ministry, we’d change! Of course, there are essentials that every ministry ought to have — gospel clarity, discipleship goals, and expository preaching, to name a few. But the Lord has used a variety of ministries over the years to accomplishHis kingdom purposes. It may be that a pastor just loves God, loves people, and wants to help them know Jesus. He may never have been taught “expository preaching” as a specific discipline, and he may not have detailed the same discipleship goals as I have, but if he loves God, His Word, HIs gospel, and HIs people — God can use him in a way that is unique to his personality and giftedness. My ministry and church is not the only viable one in my area and I must remember that I’m not building my own kingdom, but I’m cooperating with other local gospel preaching pastors and churches to build God’s kingdom. 3. A pastor must resist the temptation to isolate himself from other local pastors. Well, my previous point already touches on this, but suffice it to say, I’m thankful for pastor friends that the Lord has provided in my life. I value their counsel and their perspective. I appreciate that they understand, first hand, the unique challenges of pastoral ministry. While I don’t always agree with them, and I wouldn’t always do things they way they would, I’m thankful for them. 4. A pastor must resist the temptation to isolate himself from the accountability of godly men. Pastors struggle with insecurity just like everyone else. This is why it is vital for a pastor to constantly remind himself that his value is found in Christ and not contingent upon the opinions of others (please see previous post). Also, no one wants to be “nitpicked” or lose the freedom to minister because he feels he is always under someone’s thumb. But there ought to be at least a couple of godly men in his church that he looks to for reasonable accountability. There are two reasons a pastor may be tempted to resist reasonable accountability — one is unacceptable, the other is understandable. 1) He’s trying to hide or cover up his own failures. When a pastor makes a mistake, or does wrong, he needs to own up to it. If the accountability he has is reasonable, they will understand that he is going to make mistakes. 2) He’s afraid of accountability because he’s been burnt before. I would imagine anyone who has pastored for any length of time has been falsely accused, misunderstood, and/or misinterpreted — many of us, on more than one occasion. It’s enough to cause any man to become “gun shy” to accountability. What helps me with this concern is to understand that my own experience has hopefully prepared me to choose men who won’t abuse their roles as accountability partners. A seasoned pastor advised me years ago to weight the concerns of others based upon their level of spiritual maturity — this is wise counsel. But those who shun all accountability are putting themselves in a very dangerous position. ← 4 Dangerous Temptations a Pastor Must Resist (part 1).